What are the Taxes on Bonuses? End of the year may rain some additional compensation on top performing employees. Based on pay their structure, some companies decide to award bonuses. So, if you’re one of the awarded employees, how to account on your tax return for a bonus received? 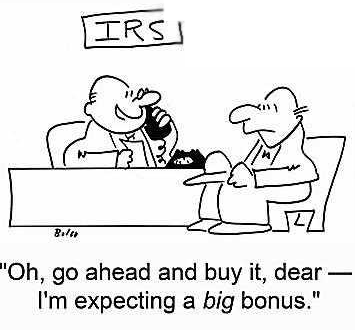 The IRS describes bonuses as a supplemental income and if you get one, you are responsible to report it on your tax return and pay appropriate taxes. Some examples of common supplemental income include: commissions, overtime, awards, back and retroactive pay, payment for accumulated sick leave, severance pay, and nondeductible moving expenses. That depends on the employer who can decide to bundle a bonus together with your regular pay. In that case the bonus you receive is not distinguished from your pay and your salary payment for that period increases by the amount of the bonus. The employer then subtracts taxes based on your withholdings. The other option is when the employer decides to award you a bonus but separates its amount from your regular pay. Under that scenario, your bonus will be taxes using either the percentage method or the aggregate method. Under the percentage method, the employer will withhold 25% of the bonus for tax purposes. In that case, if you receive a $1,000 bonus, it would mean that only $750 stays in your pocket and the reminder allotted to tax withholding. The aggregate method is a little more complicated as it requires extra steps to calculate the exact withholding amount. Under this method, the employer adds the bonus amount to your pay and calculates the taxes as if this was your regular salary. Then, from that amount your regular tax is subtracted to determine how much tax to withhold from the bonus. To illustrate it, if your regular salary is $2,000 and typical withholding $200, with $1,000 bonus your pay period salary would be $3,000 which may translate to $325 withholding. To calculate how much of that should relate to the bonus, subtract $200 (regular withholding) from $325 (withholding based on salary and bonus) to receive $125 that should be deducted from the bonus for tax purposes. (Withholding amounts may not be exact, they are arbitrary for didactic purposes; actual withholding may differ). When an employee receives more than $1 million in supplemental wages, that amount is a subject to a 35% tax withholding. In either case, you as an employee have very little control over the tax withholding method of a bonus you receive. That compensation will appear on your W-2 form that lists all types of remuneration received; social security, Medicare, and other taxes paid will not make distinction on whether they were derived from regular pay or supplemental income. For more on wages and other forms of compensation, see IRS Publication 15. Additionally, Publication 17 discuses wages and compensation from the employee stand point and what should be reported on your tax return.